Don't be afraid to experiment with the flavour of your cake tiers. Remember that the heavier the layer, the bigger the tier. For example Fruit cake is heavier than chocolate cake. If you place the tier of fruit cake on the tier of chocolate cake, there is a high chance that the top tier will sink through the bottom tier during the ceremony. It is also worth considering the season when choosing your cake, particularly if you plan to use filling such as butter cream, icing or mousse for a summer wedding. These fillings do not hold up well under heat and you run the risk of them melting unless kept refrigerated until the time of cutting. The shape of your cake is also worth consideration. Most couples stick with the traditional circular cake to symbolise eternity. This does not have to be the case, square and heart shaped cakes are proving increasingly popular, so think about what will work best with your theme. For those on a tighter budget it is worth looking at the option of a cupcake tower with a single cake as the top tier. This often works out the more cost effective option. Alternatively, why not think about decorating the cake yourself after the baker has made and iced their creation. A piece of lace from the bride’s dress with an elegant brooch on each layer can look sensational, or simply place a few flowers to match the bridal bouquet on the top layer for a sleek finish worthy of a chic girl about town. Whilst some bakers will deliver and assemble your cake on the day of your wedding, it is worth considering the transportation of your cake, should it be required. Firstly, you need to think of the size and style of your cake. 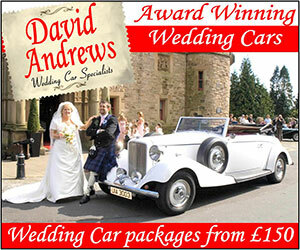 Is the vehicle that you have suitable for your needs? 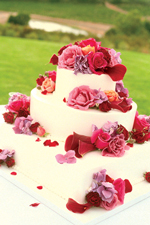 If your cake is tiered and on pillars, the cake should be transported unassembled. The base needs to be placed on a sturdy board. In most cases your supplier will provide this, but should you need a little extra help a piece of 1/2" thick chipboard or plywood slightly bigger than the diameter of the cake is perfect to give you that little extra support. The smaller layers can either be transported in boxes, (use two taped together if you feel that one is not secure) or in pots and pans. If you have a stacked cake, where the tiers are joined together, then you have no option but to transport the cake assembled. Unless it is over three tiers, the best method is to place the cake either in a box frame (your baker should be able to help with this) or in foam as this will not damage any of the icing during transit. If you are using a family car then, where possible, the cake should be placed on the floor. Alternatively, if there is not enough space then you must move the front seat back as far as possible and place a passenger in the back to avoid toppling. Remember, the care that you take transporting the cake is imperative to the cake’s condition. - Discuss your budget with your baker from the start. Not only will this ensure that you have no surprises on final payment, but it also gives your baker an indication of the options available to you. 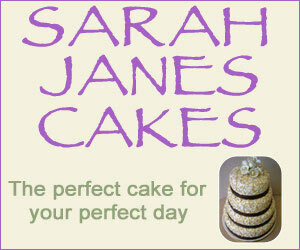 - Ask your baker do they freeze their cakes or are all baked fresh as it may impact on the shelf life of the cake after. This is particularly important if you plan to stick with tradition and freeze a Layer of fruit cake for your first child's christening. - Make sure you have an idea of the number of guest you are having, this is important to work out the size of cake you require to ensure that everyone gets a slice. - Decide if you are having your cake as an after dinner treat or if you are going to serve it as desert. You need to check that your venue will allow this as an option, if they do your baker will need to have an idea of your menu to ensure that the cake works as the grand finale. - Make sure that you see a few samples of the bakers work and that you are using a reputable company often bridal open days at hotels are the best place to do this, you can also book in for your taste test at the same time. - As with all service providers make sure that you get everything in writing so both you and the company are in no doubt of the expectations. "Cutting your cake is one of the most symbolic aspects of your wedding day."